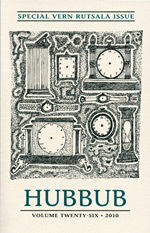 “While the poetry written over the second half of the 20th century and the first decade of the 21st has been rich and various, there are few other writers who have produced as sustained and consistent a body of rewarding work as Vern Rutsala ’56.” So write the editors of the latest issue of Hubbub, which includes several of Vern’s marvelous poems along with essays by writers Carlos Reyes, Mark Jarman, Charles Baxter, and Maura Stanton, who demonstrate how Vern has proved an inspiration to several generations of poets. The issue has a strong Reed connection, with submissions from former instructor Maxine Scates [English, 1989–2006], and from writers featured in the Visiting Writers series, including Paulann Petersen, Christopher Howell, and Dorianne Laux. without ever mentioning those sad lakes, the yolks. and have a name printed on the tip of your tongue, ready. For a look at Vern’s career, see “Writing Life,” in Reed, Winter 2006. He and his wife, Joan Colby Rutsala ’55, have three children, including writer Matthew R. Rutsala ’89. 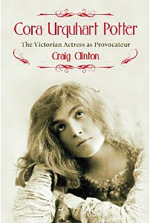 The unlacing of Victorian morality is often seen as the product of irresistible historical forces such as the rise of the middle class and the advent of the moving picture. But social values are also shaped by singular individuals who, by force of their writing, their art, or their personality, can melt hearts—or harden them. 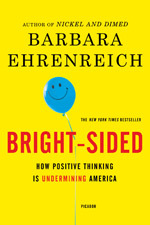 If you’ve ever been told to smile—for no particular reason—you’ll appreciate this mordant dissection of the cult of optimism in American life, as exemplified by motivational coaches, prosperity ministries, pop psychology, and the credit crisis of 2007. Barbara traces today’s positive thinking to the “New Thought” of the late 19th century, itself a reaction to Calvinism’s dour insistence on our inescapable depravity. New Thought envisioned a fundamentally benevolent universal spirit, promising health and abundance for those who believe. Embraced in various forms by transcendentalists, Christian Scientists, and pioneering psychologist William James, New Thought was a direct precursor to the Depression-era best seller Think and Grow Rich. From there, Barbara charts a direct line to Norman Vincent Peale’s 1952 The Power of Positive Thinking (still in print) and Rhonda Byrne’s The Secret, which posits a “law of attraction” with supposed roots in quantum physics. She colorfully documents the replacement of rational business management with mystical shamanic journeys for top-floor executives, who embrace positive thinking as a way of deflecting responsibility for downsizing away from themselves and onto the workers they have displaced. Where Bright-Sided seems to overreach is in suggesting that the Iraq war can be traced to a surfeit of positive thinking and that the mortgage meltdown stems directly from the same blinkered optimism. One could equally well pin both disasters on ambition, greed, and hubris. The book lacks the immediacy of Nickel and Dimed, Barbara’s classic account of life as a minimum-wage worker. But it bluntly and bracingly argues a sensible notion: that for nations and individuals alike, it takes more than a positive attitude to create sustained success; it takes clear analysis and appropriate action. Sometimes it even takes anger. We hear the words that African American slaves sang on Southern plantations long ago and we’re inclined, usually, to imagine a simpler time—and simpler souls entrapped in an earthly hell, yearning for freedom in the next life. The yearning can manifest as happy pandemonium (think “Go Tell it on the Mountain”) or as wistful longing (“Swing Low, Sweet Chariot”). 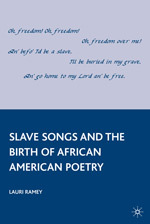 But we seldom read slave song as complex, layered, or subversive. In this groundbreaking book, Lauri Ramey ’74 seeks to restore to the songs’ anonymous authors “a complete human identity.” She argues that slave songs constitute “some of our finest and earliest American poems,” and takes a fresh look at them as potent political statements rich with nuance and otherworldly metaphor.